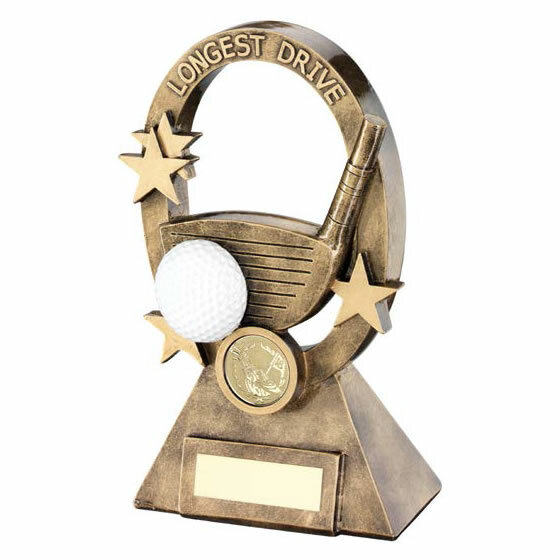 Golf Longest Drive trophy crafted in resin with bronze and gold colour finish. Features an oval frame enclosing a golf driver club head and a white golf ball, with gold stars and a 1in centre. The frame includes a 'Longest Drive' legend at the top and is set on a base with engraving plate. Stands 7.25in / 184mm tall. Offered with engraving options for the base plaque.